I've blogged about this before but I thought I would post an update here about the internet download and upload speeds I am getting from Charter cable. There's a web site where you can check how fast your internet connection is: www.speedtest.net. If you want to try it, make sure to click on the blue/green box towards the top of the page that says "Begin Test." Don't click on any of the other buttons because those are all ads for something else. 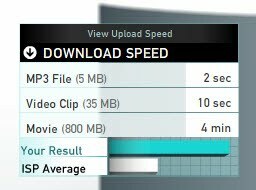 When you click on the Begin Test box, it will then conduct a test and tell you what your download and upload speeds are. Here's the results I got. I was pretty amazed - these are pretty darn fast! 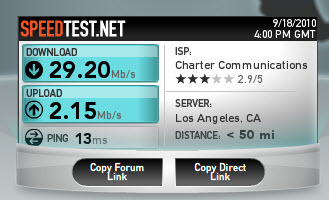 Bill just signed us up for cable tv, internet and telephone... let's see how fast this is. We are moving and we have to give up the FIOS and go back to cable. We've been on the optical for 22 months and never had a glitch, outage or had to reboot anything associated with the internet. I have had to reboot the DVR but its constantly recording away the last two channels on the remote possibility that someone might turn the TV on, hit the "last" button to go to the channel that the tuner was switched to and have the see what they missed by pressing the rewind key. Actually I am surprized that a hard srive could turn for that long without failing. So Donna, how do you like having cable? It has to be better than DSL! You know what is pathetic is the connection we have at work. Most of the time it is soooo slow... but then maybe its because everyone is downloading movies, haha..